The General Dynamics F-16 Fighting Falcon is a single-ingine multirole fechter aircraft oreeginally developed bi General Dynamics (nou Lockheed Martin) for the Unitit States Air Force (USAF). 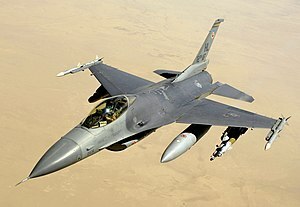 ↑ "Iraq Accepts First Lockheed Martin F-16 Aircraft". Lockheed Martin. Retrieved 13 September 2014. ↑ 2.0 2.1 "F-16 Fact Sheet". Retrieved 13 September 2014.